Rhodium has proven to be an extremely useful metal due to its ability to catalyze an array of synthetic transformations, with quite often-unique selectivity. Hydrogenation, C-H activation, allylic substitution, and numerous other reactions are catalyzed by this metal, which presumably accounts for the dramatic increase in the number of articles that have recently emerged on the topic. 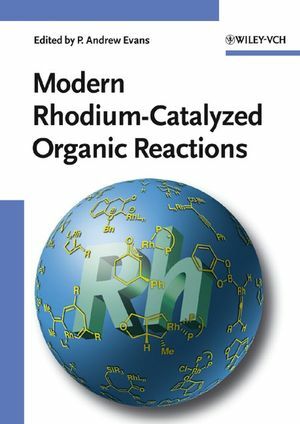 "Modern Rhodium-Catalyzed Organic Reactions" is an essential reference text for researchers at all levels in the general area of organic chemistry. This book provides an invaluable overview of the most significant developments in this important area of research, and will no doubt be an essential text for researchers at academic institutions and professionals at pharmaceutical/agrochemical companies. P. Andrew Evans is a Professor Department of Chemistry at Indiana University, Bloomington. He obtained a Ph.D from Cambridge University under the supervision of Professor Andrew B. Holmes, F.R.S, and was a NATO Postdoctoral Fellow at the University of Texas at Austin with Professor Philip D. Magnus, F.R.S. Professor Evans' research has been recognized on several occasions. Recent awards include a Camille Dreyfus Teacher-Scholar Award, a Johnson and Johnson Focused Giving Award and the Pfizer Award for Creativity in Organic Chemistry. "...a useful contribution to the literature of transition-metal catalysed organic chemistry, and will be of value to both academics and industrialists." "... this timely book is a concisely written and highly valuable reference that will find widespread use by scientists ..."
"Directed towards graduate students and synthetic chemists at all levels in academia and industry, it represents an attempt to bring together and categorize, in a systematic and comprehensive manner, a very disparate collection of numerous rhodium-catalysed organic reactions... Although not exhaustive the coverage does provide an excellent perspective on the enormous and wide-ranging activity associated with the application of rhodium catalysis in synthetic organic chemistry. The book is well-written and presented... The book contains an excellent, comprehensive index, which represents a refreshing change from many similar texts of this genre and such attention to detail is to be applauded. ...this book provides, in one volume, a detailed account of the range of current methodologies and applications in organic synthesis that are available using rhodium catalysts. It should therefore serve not only as an excellent reference text but also as an excellent source of ideas from which to develop further the ever-widening subject of rhodium catalysis by the practitioners of synthetic organic chemistry. Finally, the asking price ... for a volume of this sort seems entirely reasonable in present-day terms.